I'll admit that when Amy from I Heart Faces asked me to make some cookies for a photography workshop, I was a little, ok...a lot, intimidated. The cookies were part of a stylized birthday party with some absolutely adorable little girls. Amy found the inspiration for the flower cookie from this AMAZING blog from (I think) Japan, called Rosey. All of her cookies are incredible! With that as a starting point, Amy came up with some designs for heart cookies to coordinate with them. Want to make the flower cookies? 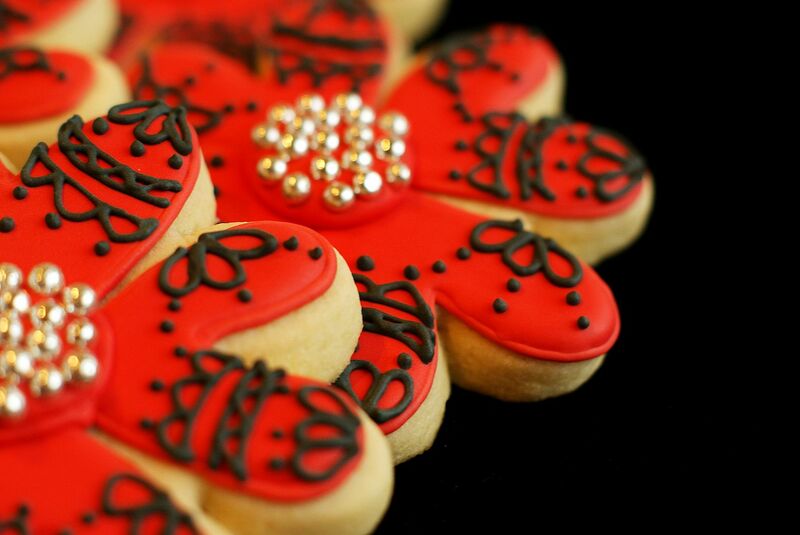 You'll need royal icing in just two colors....Super Red and Super Black. 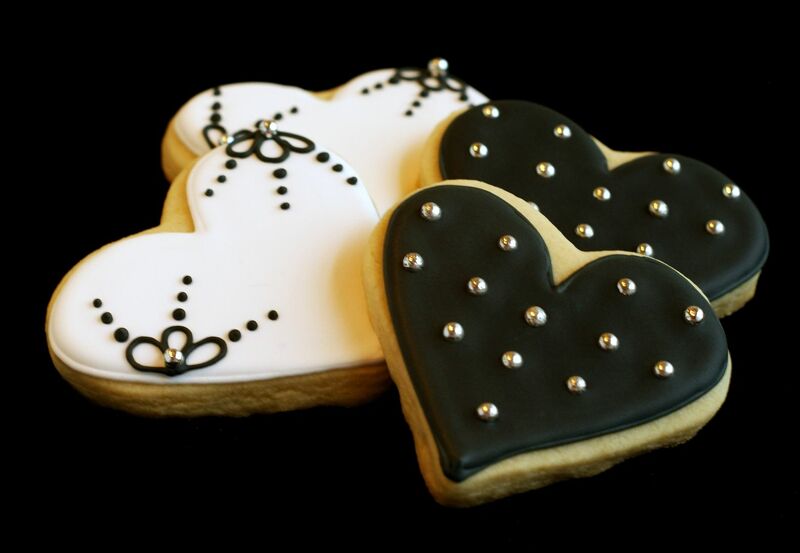 To make the black hearts, you need only 2 things: black royal icing and silver dragees. Well, and the secret weapon for placing dragees....tweezers. CLEAN tweezers! Place the dragees on the cookies while the icing is still wet. 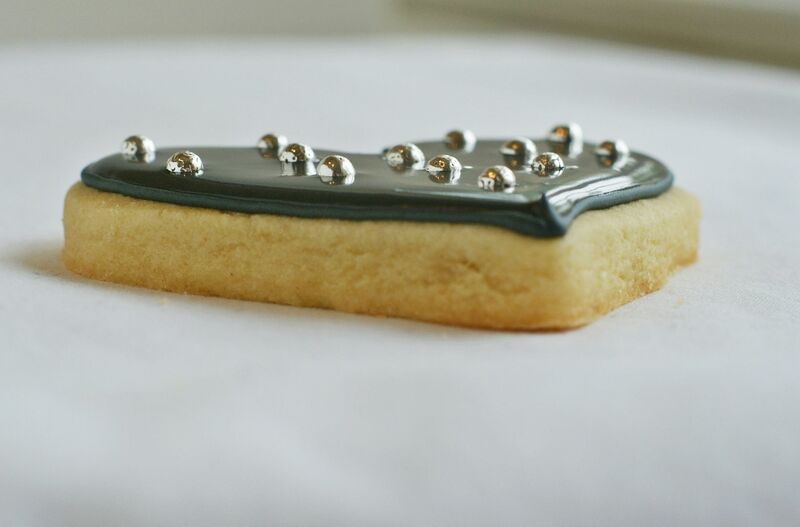 True story: when I was a little girl, I used to steel those little silver baking goodies from my mom's pantry and eat them in my room. Hi Bridget! Beautiful cookies! SO I have a question...I have made like a thousand batches of royal icing and I notice that sometimes mine is too fluffy and therefore does not dry like hard candy but rather hard dust. Does this every happen to you? If so any suggestions? What recipe do you use? omg i doubt i could make cookies as nice as those! they look incredible! As always, a beautiful job. I love the colours, gorgeous! Sure! The recipe I use is linked in the recipe index (in the nav bar). Be sure not to overbeat your icing. Also, when adding water to flood cookies, stir in a bit at a time, don't beat with a mixer. Did you know you can't even buy dragees in California? I remember eating them as a kid too, and my mother in law still has a stash of them from when they were legal, but no more. I looked all over for them for a cake I was making only to learn they're illegal here. Harumph! Son davvero graziosi, bravissima come sempre! your cookies are gorgeous, you are so talented! BEAUTIFUL BEAUTIFUL BEAUTIFUL!!! did I say I LOVE these? 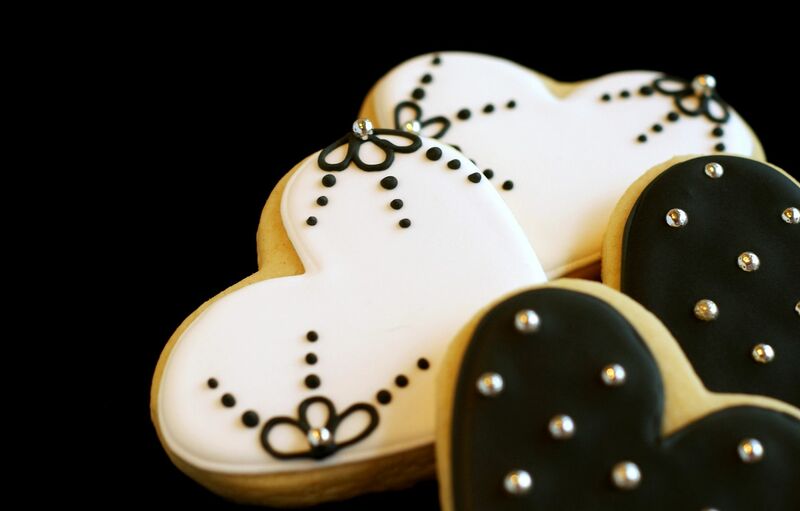 I have been admiring her cookies FOREVER.... they are just stunning... and SO ARE YOURS!!! Fantastic job girl!!! These are gorgeous, Bridget! Absolutely beautiful. Very pretty Bridget. 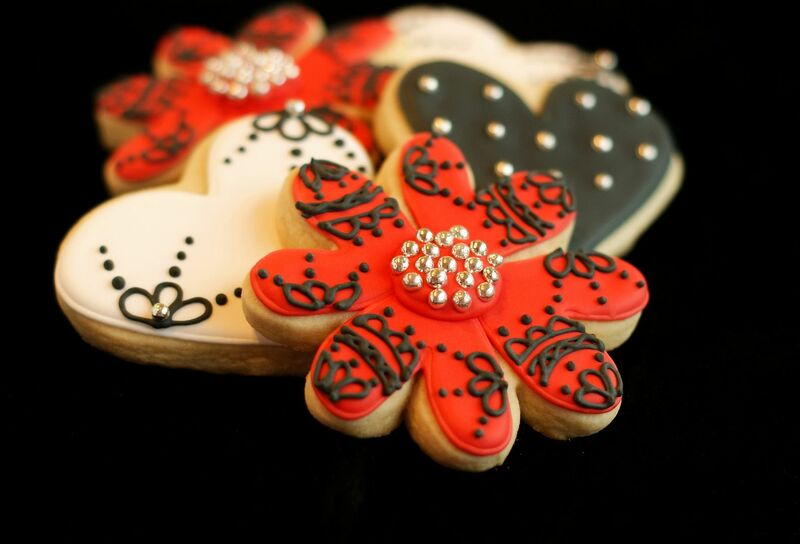 Especially love the design work on the red heart cookies! These are gorgeous creations, all from the simple flower and heart cutters! I might resort to dots of RI rather than Dragees, although I would not get the metallic effect. Love, Love, Love! Those are so beautiful, you are very talented! The cookies are amazing! I can remember seeing gold dragees on my g'parents anniversary cake when I was a kid and thinking, "you can eat the gold beads?!". I had no idea they were now "illegal". These are so pretty! I absolutely love them. I used to be scared to eat the silver dragees when I was little. They just didn't seem edible to me. Look at how gorgeous those are. You are incredibly talented! these are such pretty cookies! i'm always amazed by your cookie-decorating ability. i wish i had a hundreth of your talent! Great design Bridget. So simple and yet so elegant! Your photography skills always amaze me too! You've got such a good eye for content and design. Your cookies always blow me away! Love them! Love this post. The cookies are gorgeous! I wish I could decorate so beautifully! Those cookies are so pretty! Thanks for another great tutorial(: I love the slideshow! These cookies are so beautiful! My weakness has always been basic chocolate chip cookies, but I'm very tempted to break out of my box! I think I'm gonna need to wear a seat~belt of some sort when I pop over here into this LOVELY~ness! and hit my blonde head on the coffee table! YOU MUST BE LOOKING AT SOMETHING CUTE THAT BRIDGET DID! I pulled myself up off the floor and said YEP! Now my hair looks like PHYLLIS~freakin~DILLER! The designs are like ROYALTY! And the dragees...well I LOVE to crunch down on a good DRAGEE! Grew up on those things! Wow, Bridget - those cookies are absolutely gorgeous! WOW! I seriously think those are my favorite cookies you've posted. Well, I find myself saying that a lot, lol. But they are incredible! Absolutely beautiful work! They are SO utterly beautiful! Just stunning. You did an amazing job! I am glad you were able to get some gorgeous pictures of your fabulous cookies! Too pretty for words! 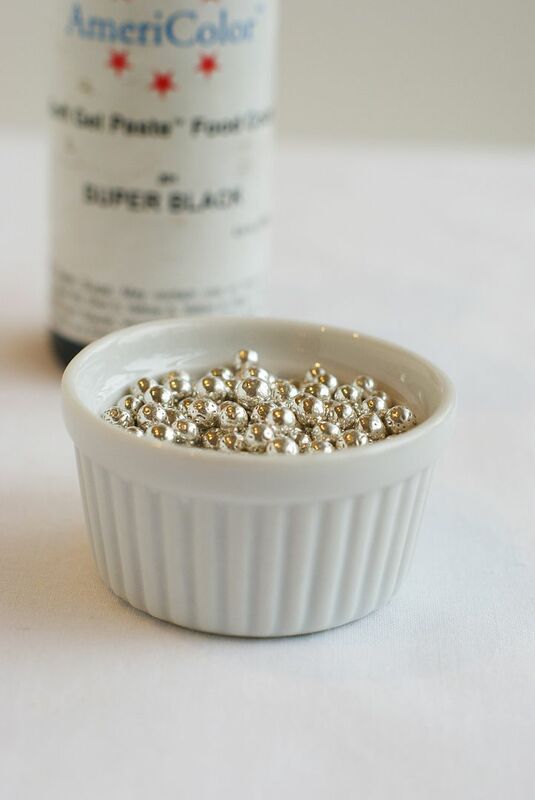 My friend was having a heart attack last Christmas because she couldn't find any of those silver beads in California. Do you know they are illegal there. I kid you not! How crazy is that? These are stunning! I love the color scheme. I've never had dragees since they're not available in CA. But they look beautiful atop the cookies! Gorgeous as always! I am always so excited to see your amazing cookie posts! Oh geez... I wish I hadn't posted my cookies! These are beautiful. My grandmother and great-grandmother made the most amazing Christmas cookies with the little silver dragees. I have tried to recreate them and have decided you've got to practice a lot. Thanks for the tweezers tip, and for spurring me on in my quest to made spectacular cookies like you! My grands need to share in my fun memories. Um, we can't eat the balls? I still do. Uh-oh. 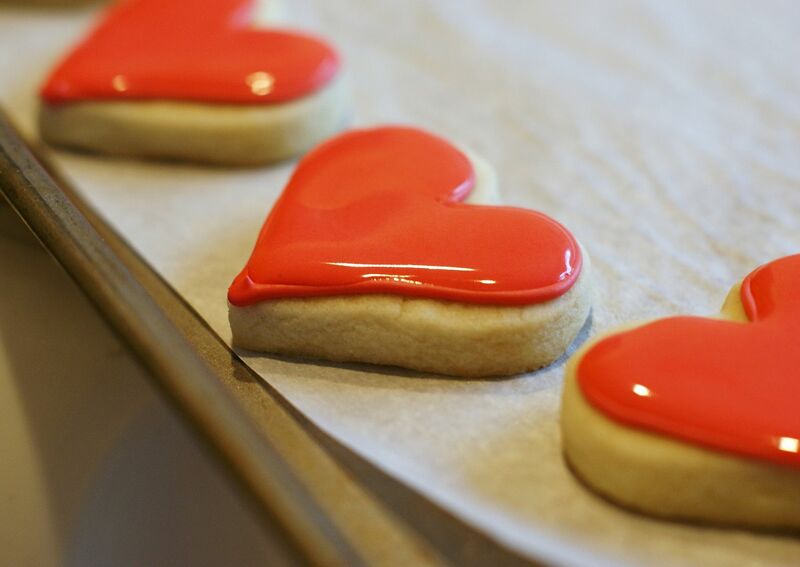 Love the slideshow, and the red heart cookie pic it just awesome! I can tell you are enjoying your new camera! I truly cannot believe how beautiful these cookies & that little girl's party are. The red, black & white theme is awesome & your decorating skills are amazing! i cant ever make black icing! i use the same colors you do but it always come out a grey color. the one time i was able to get the icing black i ended up putting so much coloring in the icing it tasted so bad i couldnt use it! have any tips or ticks for me?! WOW. WOW. WOW. This are insanely gorgeous. I love the design on them. All I can say is wow!! Those are beautiful cookies. What a lucky little girl to have such a stylish party! So nice! I used to eat those little silver balls when I was a kid. Mom used them on her sugar cookies. I wondered why I could never find them in the stores. I picked you for the Stylish Blogger Award! They are so beautiful! I love the way dreagges look, and recall eating them as a kid. I don't think I'd attempt it now-like mom always said-you only get one set of teeth :) fear of broken tooth gets me, but I didn't know that they say for decoration only. These are positively stunning. I'm not usually into cutesy detailed stuff like this but with the great pictures and everything else I can really appreciate what's been done here. My son-in-law is going through a divorce and all the throes of the financial challenges, etc. I'm going to make him some pretty decorated gingerbread cookies and hot glue hooks to the back so he can hang 'em on the tree. A couple dozen "ornaments" for the tree at the price of the ingredients for a batch of cookies. You did a fabulous job, Bridget! I snickered a little when you said you were nervous...girl, you are a STAR in the cookie world. You do realize that, right?! So talented...no need to ever be nervous about how much someone will LOVE you! Hi Bridget!! These are simply beautiful!!!! Great job as always!! You did a great job with those cookies! They're absolutely gorgeous. STUNNING!!! Your cookies get better with every post. I am green with envy. Man - these cookies are gorgeous - as with everything else you do. I was thrilled when I found the silver and gold balls at Oregon Dairy! A happy day. Now if only my cookies would look as beautiful as these! Wow!This cookies are killing me! Where can you find the silver dragees? I've been looking and they are elusive!